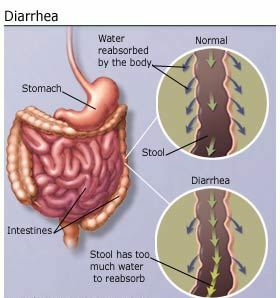 Causes of diarrhea especially acute diarrhea are parasitic, bacterial or viral infection while chronic diarrhea is caused by irritable bowel syndrome or inflammatory bowel disease which can be treated by taking foods for diarrhea that include a complete package of diet for diarrhea. Some causes of diarrhea along with diarrhea symptoms are listed below. Bacterial infections: Diarrhea causes include bacterial infections as large number of several types of bacteria entered into the body through contaminated food. Common bacteria in this regard are Escherichia coli, Shigella, Salmonella and Campylobacter. Reaction to medicines: blood pressure medicines, cancer drugs, antibiotics and antacids containing magnesium produce chances of diarrhea causes. Food intolerances: Some people cannot digest artificial food color or sweeteners and lactose which is a sugar found in milk. Intestinal diseases: colitis, inflamatory bowel disease, Crohn’s disease, celiac diseases are different causes of diarrhea. Functional bowel disorders: diarrhea may be a symptom of irritable bowel syndrome. Parasites: Parasites can enter in our body through water and food and then settle in our digestive system thus causes diarrhea. Viral infections: diarrhea causes due to some viruses e.g.rotavirus, herpes simplex virus, viral hepatitis, Norwalk virus, and cytomegalovirus.